By Any Means brings together about twenty innovative works from the Morgan’s collection, including many recent acquisitions, by artists such as John Cage, Sol LeWitt, Vera Molnar, Robert Rauschenberg, Betye Saar, Gavin Turk, and Jack Whitten. Stephen Vitiello (b. 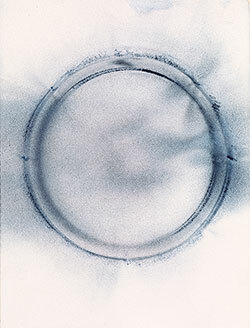 1964), Speaker Drawing (22.06), 2006, Pigment and spray fixative. The Morgan Library & Museum. Gift of an anonymous donor, 2012.41. Photography by Steven H. Crossot, 2014. Courtesy of the artist.